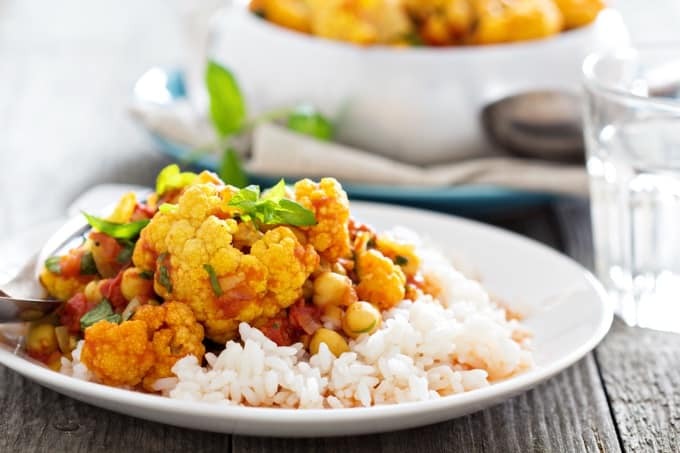 Today I’m sharing a recipe for WW Quick Vegetable Chickpea Curry. Perfect for vegetarians and vegans or anyone looking for a gluten-free, low calorie meal idea you make in a single skillet. 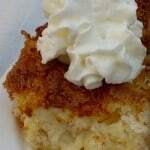 This is a recipe that was featured in Weight Watchers magazine (affiliate link) a while back. I made a few changes to suit my family’s tastes and what I had on hand. Enjoy! 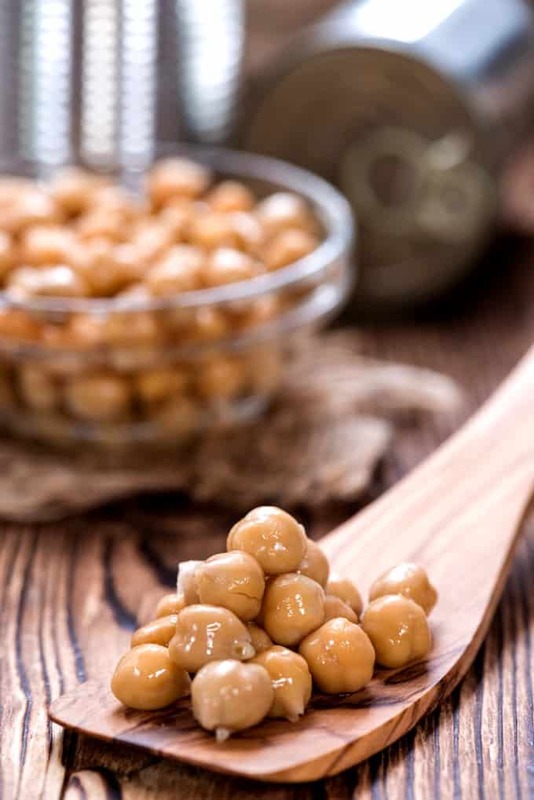 Did you know that chickpeas (also known as garbanzo beans) have 12.5 grams of fiber per cup, or roughly 50 percent of your daily needs? This is great when you are trying to lose weight because foods high in fiber keep you feeling full longer. 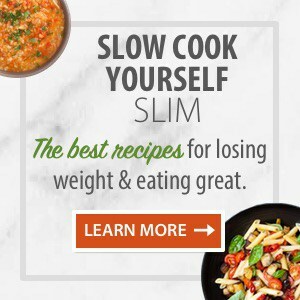 This is confirmed by a recent study in which obese people trying to lose weight who ate a serving of pulses (beans, lentils, or chickpeas) per day lost 3/4 pound more than people who didn’t include pulses in their diet. 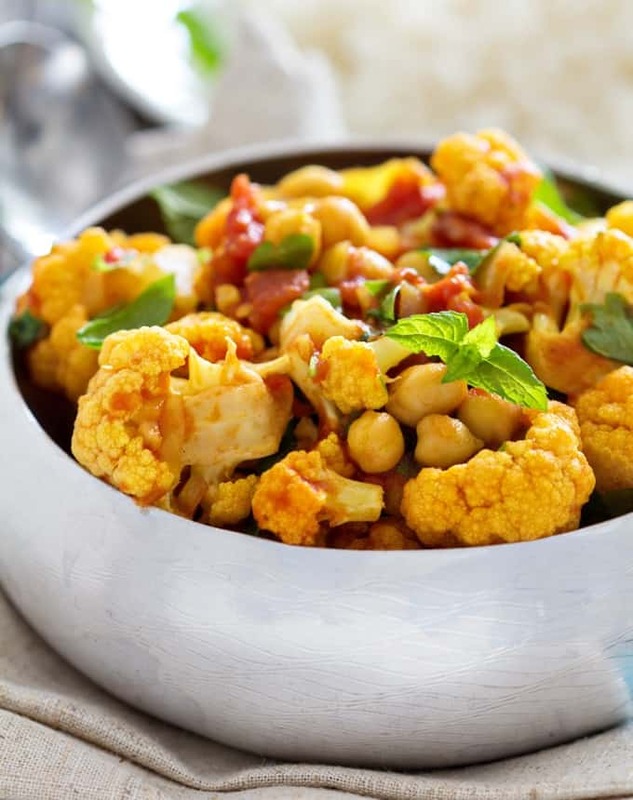 How Many Calories/WW Points in this Quick Vegetable Chickpea Curry Skillet? 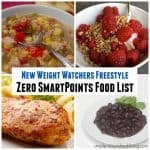 According to my calculations each 1 cup serving has just 138 calories and ZERO (0) WW SMARTPOINTS. A hearty, satisfying, low calorie recipe packed with fiber and flavor. 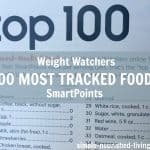 This recipe was featured in the January/February2018 issue of Weight Watchers Magazine (affiliate link). The suggested serving method was to spoon it over hot split small baked potatoes. 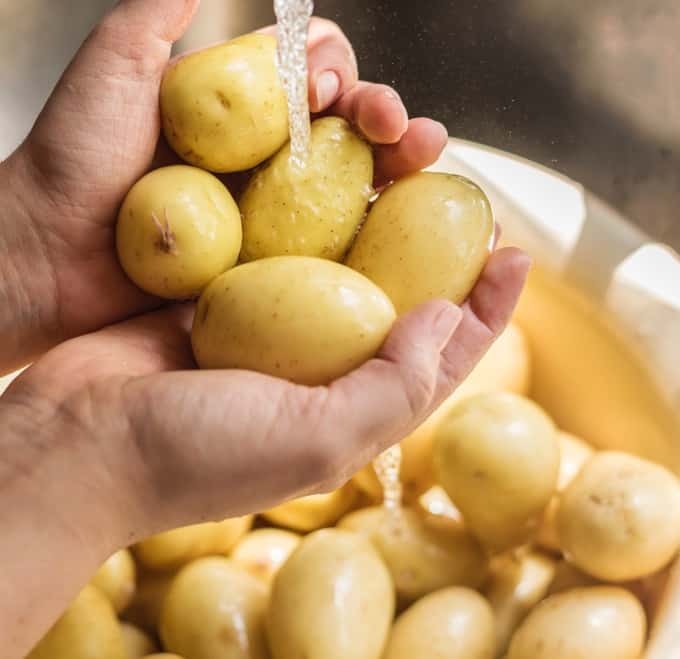 For the tastiest baked potatoes, scrub and poke a few time with a fork and bake on a baking sheet at 400°F until fork tender, about 45 minutes. I like to use my toaster oven for this. Or if you are in a hurry, you can place the potato in your microwave and cook on high for 3 to 5 minutes. This curry would also be delicious scooped over rice or folded into a pita or flatbread. Optional garnishes include non-fat plain Greek yogurt, chopped cilantro and lime wedges. The original recipe called for three different dried spices: curry powder, cumin, and coriander. Because curry powder already has cumin and coriander in it—and I don’t have dried coriander—I just used more curry powder instead. 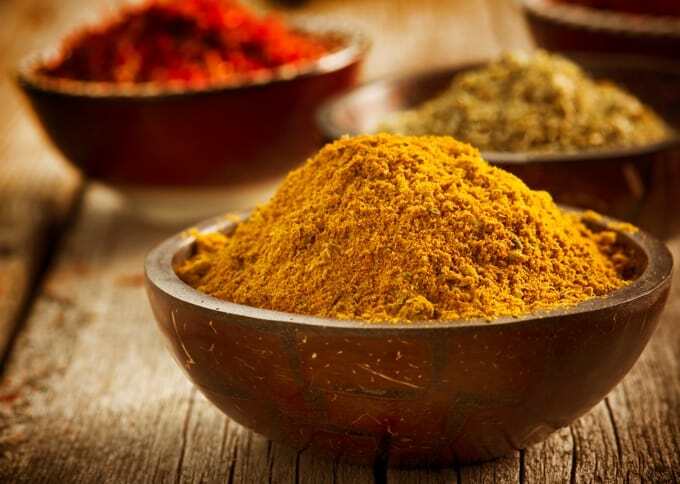 Curry powder is usually a mixture of turmeric, chili powder, ground coriander, ground cumin, ground ginger and pepper, and can be bought in mild, medium or hot strengths. If you don’t have curry powder and want to make your own here’s a good DIY curry powder recipe. Since it’s a zero points food that I love, I also increased the amount of cauliflower from 1 cup to two. And I used an entire can of chickpeas instead of just the one cup specified. 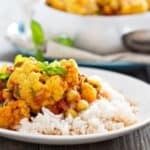 If you’ve made this low fat Vegetable Curry, please give the recipe a star rating below and leave a comment letting me know how you liked it. 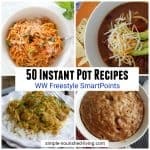 This quick and easy one-pot vegetable curry is an easy, healthy 0 SmartPoints dinner perfect for vegetarians and vegans, or anyone looking for a low calorie meal idea! Coat a large skillet with cooking spray and then set it over medium heat. Add the chopped onion and cook, stirring often, until softened, about 5 minutes or so. Once the onion has softened add the garlic, ginger, and curry powder. Continue to cook for about 1 minute, stirring constantly to prevent the spices from burning. Add the bell pepper, eggplant and cauliflower and cook, stirring frequently, until they are crisp-tender. This should take about 6 minutes more. Next add in the chickpeas, broth and lime juice and stir everything to combine. Simmer the mixture and cook for about 5 more minutes, until the chickpeas are heated and flavors have had a chance to come together. Now taste the mixture and add salt and pepper to taste. 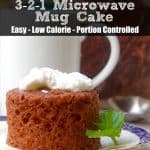 This recipe is featured in the January/February2018 issue of Weight Watchers Magazine. The suggested serving method is to spoon it over hot split baked potatoes. 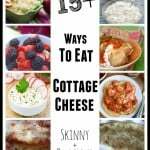 It would also be good in over a small serving of rice or quinoa or stuffed into a pita or crepe. This was delicious. I omitted the cumin, which I loath; but followed the rest of the ingredients and instructions. Even better the next day for lunch.